Magnum Managed Networks Software (MNS), combined with a Magnum 6K-Series Switch, provides power and efficiency in a managed Ethernet platform. 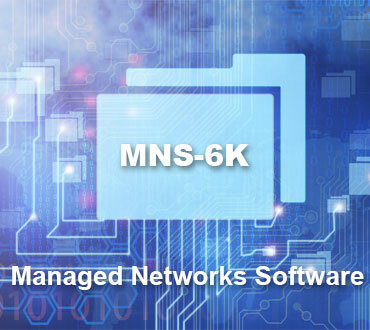 A full range of industry-standard software functions in the MNS-6K software product enable the versatile Magnum 6K Switches to perform efficiently in a wide range of managed LAN applications, including redundant topologies.Both GUI and CLI based available. Use of the Internet and high performance software applications continues to grow at a rapid pace. Factory automation, industrial control, video streaming, database queries, communications systems, and file transfers all place a premium on performance, reliability and security. Today's managed networks need quick response times with trusted services when delivering and receiving data. Graphical User Interface: "Cradle-to-grave" GUI operation, GUI configuration options, User-based Access Control, Export Log, Auto Boot Mode, Editable System Prompt, easy save and load of configs, FTP/TFTP, and more. SNMP (Simple Network Management Protocol) v1, v2, v3: Provides basic network management by using agent software in the Magnum 6K that collects and saves pre-defined data, and responds to queries and commands from a network manager station. v1 is implemented per RFC1155, RFC1157, RFC1212, RFC1213 (MIB II), Bridge MIB RFC1493, and RFC1757 plus security enhancements. v2 is per RFC 1901-08. v3 provides encrypted authentication and access security and is per RFC 2271-75. All are supported by TCP/IP and UDP/IP. RSTP-2004 (Rapid Spanning Tree Protocol), IEEE 802.1w: Similar to STP but faster in changing interconnection direction. Used for redundant rings and meshes of managed switches and routers. Industry standard compliant for inter-operability supports rings up to 100+ units with average full recovery of about 2 ms.
Link-Loss-Learn Feature: The Link-Loss-Learn (LLL) simplifies and speeds up fault recovery for Ethernet switches used in redundant LAN topologies. When LINK is lost on a port on which this function is enabled, the address table of the switch is immediately reset and the address learning process is re-initiated. This allows rapid re-configuration and fast fault recovery, no waiting for switch buffers age out. SNMP (Simple Network Management Protocol) v1, v2, v3 - Provides basic network management by using agent software in the Magnum 6K that collects and saves pre-defined data, and responds to queries and commands from a network manager station. v1 is implemented per RFC1155, RFC1157, RFC1212, RFC1213 (MIB II), Bridge MIB RFC1493, and RFC1757 plus security enhancements. v2 is per RFC 1901-08. v3 provides encrypted authentication & access security and is per RFC 2271-75. All are supported by TCP/IP and UDP/IP. RMON (Remote Monitoring) - A network management protocol more extensive and more powerful than SNMP. The Magnum MNS-6K software supports four groups of RMON (statistics, history, alarms, and events). Ease-of-use features - "Cradle-to-grave" GUI operation, GUI configuration options, User-based Access Control, Export Log, Auto Boot Mode, Editable System Prompt, easy save and load of configs, FTP/TFTP, and more. STP (Spanning Tree Protocol), IEEE 802.1d - Provides interoperable support for redundant paths and connections while preventing loops in the network. Note: For S Ring see applicable datasheet. RSTP-2004 (Rapid Spanning Tree Protocol), IEEE 802.1w - Similar to STP but faster in changing interconnection direction. Used for redundant rings and meshes of managed switches and routers. Industry standard compliant for inter-operability supports rings up to 100+ units with average full recovery of about 2 ms. See S-Ring for ring structure solutions including unmanaged switches. Link-Loss-Learn feature - The Link-Loss-Learn (LLL) simplifies and speeds up fault recovery for Ethernet switches used in redundant LAN topologies. When LINK is lost on a port on which this function is enabled, the address table of the switch is immediately reset and the address learning process is re-initiated. This allows rapid re-configuration and fast fault recovery, no waiting for switch buffers age out. Alarm Relay Contact - Software operated alarm contact with user-selected alarm conditions. BootP (Bootstrap Protocol)/ DHCP Client (Dynamic Host Config.) - These tools simplify initializing and maintaining a 6K managed switch, maintaining the user's software and configuration settings for more convenient access on designated servers. DHCP as per RFC 1531 and BootP as per RFC951. Password Security - A multi-level CLI log-in is enforced to ensure that only authorized persons can execute commands on the console device. The Administrator is the highest level, 4 levels are for system operators. Remote Access Security - Remote access to SNMP via web and Telnet can be controlled by the Switch Administrator at the IP address level as desired, providing additional remote access security beyond traditional software capabilities. QoS, IEEE 802.1p - Supports packet prioritization (QoS) per port, TAG, MAC address and IP address. Port Security - The MAC addresses that are secure may be either entered by the system manager, or learned by the Magnum 6K Switch. When Port Security is enabled, illegal MAC addresses are either dropped or disabled. Applicable events are noted in the Event log. CLI commands enable the system manager to control this Port Security function. IGMP Snooping and Multicast Pruning v1, v2, v3 - Field Bus Industrial Ethernet protocols make use of publisher/subscriber models by multi-casting packets onto the network, creating heavy traffic. IGMP provides the ability to "snoop" and "prune" multicast traffic to prevent flooding. IGMP-L2, for example, enables video-over-Ethernet multicast streams from cameras to be directed to multiple viewing sites for surveillance and incident management, without Layer 3 routers. VLANs and 802.1q - Users may configure 6Ks so that traffic is segmented into VLANs. All nodes on the ports in a defined VLAN group can communicate with each other, and are secure from activity on other 6K switch ports. Tagging information is used for VLANs and QoS (Quality of Service) priority identification to be distributed across multiple managed switches. Static and dynamic (with GVRP) tagged VLANs are supported. CLI (Command Line Interface) - CLI, for the Magnum 6K's console port, offers a rich set of switch commands, including Tab Key Help feature, through a VT100 character terminal or equivalent emulation. Port Settings Control - Individual ports may be configured (or set) to operate according to the system manager's selections. Commands for settings include port enable/disable, speed selection, full-or half-duplex selection and auto-negotiation on-off selection, flow control and back pressure enable/disable. Broadcast Port Rate Limiting - The Magnum 6K family of switches with MNS-6K perform detection and port rate limiting for broadcast storms. User can set the rate of broadcast packets that are permitted per port. SMTP (Simple Mail Transfer Protocol) Client - Send an email message upon recognizing certain traps and events. RFC 821. SNTP (Simple Network Time Protocol) - Automatically synchronizes the Magnum 6K's internal clocks with other devices on the LAN, handling time-zones worldwide as well as time changes for Daylight Savings. SNTP is per RFC1769. Port Mirroring - The Magnum 6K can be software configured to mirror (i.e., monitor) any port on a specific user-designated target port, a handy feature for network troubleshooting using a network probe on a mirrored target port to analyze the network. Event Log - System events are recorded in a log in memory (up to 1000), enabling the system manager to track and analyze what has happened within the Magnum 6K system operations. The predefined MNS-6K system events relate to all of the MNS-6K software modules and functions, including intruder detection events, and cover varying system severity levels. MODBUS - MNS-6K implements the MODBUS specifications for running the MODBUS protocol over Ethernet. HMI devices as well as other industrial devices such as PDUs and IEDs can connect to Magnum 6K switches and can communicate using the MODBUS protocol. STP (Spanning Tree Protocol), IEEE 802.1d - Provides interoperable support for redundant paths and connections while preventing loops in the network. Note: For S Ring see applicable datasheet..